We all have things in our past that we would like to forget. Things we don't want anyone to know about. It is hard to be vulnerable, and to share with someone else the depth of your heart, especially when it comes to the choices you have made. Or the decisions that perhaps led you down a path you wish you hadn't gone. Sometimes, it isn't even your choices that placed you where you are. Much of the time, life happens to everyone. For some of us, maybe all if we look deep down, at some point or another, we have been on both sides of this-receiving hurt and giving hurt. I had a conversation yesterday and pieces of it have stayed in my mind. This morning, as I drove into work, I heard a song on the radio. It brought to mind this conversation from yesterday, and one specific line from what this woman and I discussed. I had shared with her that I had learned some things the hard way. Her response was that the hard way is "the only way I tend to learn." Have you ever found yourself there? Looking back at your life and realizing that everything you've learned that is of value has come THE HARD WAY? Why do we do this? Why do we put ourselves in the most challenging situations, and learn the biggest lessons through pain and difficulty? I think that part of it is fear. Really, I think ALL of it is fear. The fear could stem from any number of circumstances, but I think fear is the root of it. We are afraid of what someone will think, so we hide our sin. We are afraid that someone will see us as poor mothers so we pretend to be the best soccer moms there are. We fear that those closest to us will leave us, and so we don't let ourselves get close to anyone. There's no thief like fear..."
Many times in my life I have allowed fear to hold me captive. There are still days, still moments, where fear takes my breath away and starts my heart beating faster. It has gotten easier. Where I used to turn to Xanax to settle my nerves and anxiety, I am now embracing something Tony taught me - to use this as my "prescription" for anxiety. "Lord, my heart is not proud; my eyes are not haughty. I don't concern myself with matters﻿ too great or too awesome for me to grasp. Instead, I have calmed and quieted myself, like a weaned child who no longer cries for its mother's milk. Yes, like a weaned child is my soul within me. O Israel, put your hope in the Lord--now and always." I have learned, I AM learning, to calm and quiet myself. So, when I had this conversation yesterday with my friend, I began thinking about how I have taken the long way around for most of my life. It is what comes naturally, to everyone, I think. Everything seems simpler in retrospect. Cliche phrases, but no less true. All of that to say that when I heard this song today and it brought me back to my conversation yesterday, I really just wanted to share this song with not just that friend (though she is a big reason for this post), but also with anyone else who may need to hear these words. The video is brilliantly done as well, and maybe I've shared it here before. But it is a message worth repeating. And my dear friend, if you are reading, know that I am for you, and God is for you, and He wants you to truly understand the message in this song. Don't live in fear or listen to the lies that tell you that you aren't good enough, that you aren't worthy, and that you'll never get it right. 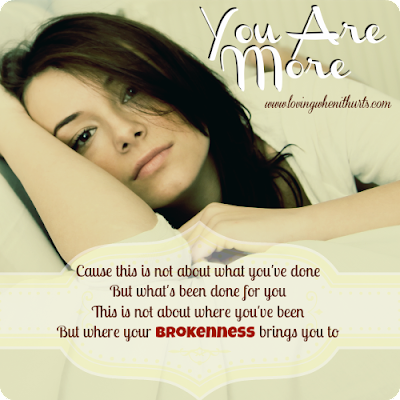 When you understand that you ARE more, you'll find the hope that you may be missing right now. That I've fallen too far to love." We don't have to live captive to fear any more! Praise God for that! !